Vancouver’s Powell Street Brewing decided to put 95 pounds of Centennial and Cascade hops into their wet hopped beer. Appropriately it is called 95 Pounds of Wet Hop Goodness Wet Hop Pale Ale. Pouring a rich orange colour, not super clear, there is moderate carbonation visible if you look closely. The head is an off-white with large-ish bubbles. There is nice almost musty smell, not an off smell, more like it is reminiscent of a cellar for wine and ale. There is a nice dry grass aroma to the whole beer and a touch of citrus. The aromas are nice and light but distinct, you can distinguish everything but you aren’t smacked in the face by them. I like the layers of flavour in this beer and that is what wet hops are all about, but Powell Street also gave malt flavours their fair run. The beer actually starts with a creamy caramel flavour that quickly gives way quickly to a light bitterness with herb notes, maybe parsley. A celery note runs under that, even a bit of fennel. On the finish there is a candied orange flavour that comes out of a sweet malt and citrusy hop. A delicious beer, I would just drink this on it’s own or eat with a meal salad. 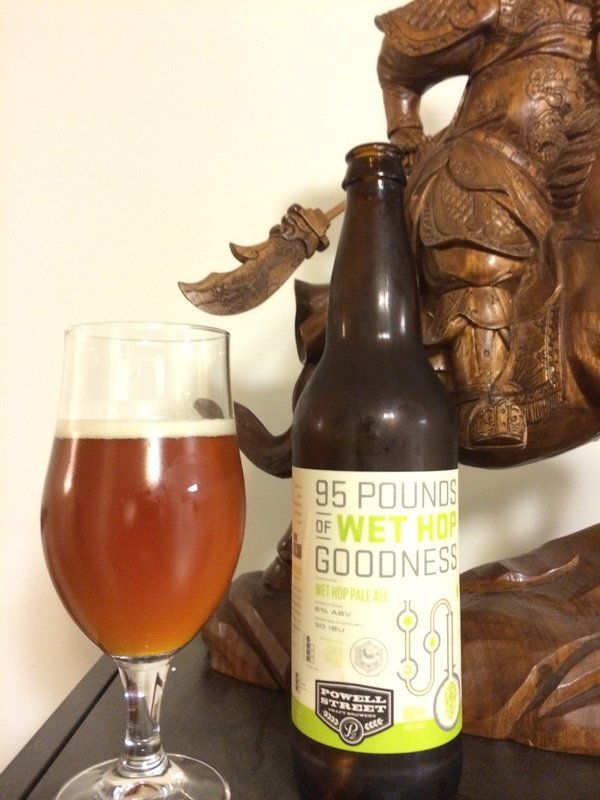 This entry was posted in Pale Ale and tagged wet hop, wet hop pale ale.